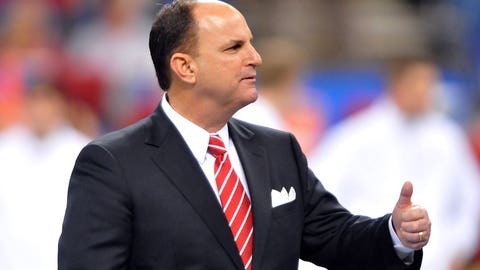 Oklahoma athletic director Joe Castiglione will share the stage with Kevin Durant and Russell Westbrook at the 2015 Oklahoma of Fame Banquet. Durant, the Oklahoma City Thunder forward and NBA All-Star MVP will be inducted into the Oklahoma Hall of Fame and will be presented by teammate and All-Star Russell Westbrook. Castiglione will present Bill Hancock, the first executive director of the College Football Playoff. Hancock is from Hobart, Okla. This year’s class will be the 88th overall and the banquet and reception will be Nov. 19 in Tulsa, Okla. There are 669 members in the Oklahoma Hall of Fame.